The ultimate ski address in the village of Big Mountain is in the Morning Eagle. Sitting right at the base of Chair 3, Morning Eagle brings a whole new meaning to ski-in/ski-out convenience. A private, secure ski locker and changing area make hitting the slopes easier than ever. The fully equipped kitchen has granite counter tops and cherry cabinets. The living room features a rock gas fireplace and the private deck that offers views of the slopes and beyond. No need to over pack with an in-unit washer and dryer handy to throw in loads of laundry whenever you feel like it. The bedroom has a king bed and TV. The living room also has a queen pullout sofa bed. To relax, you can enjoy the community rooftop hot tub and BBQ with slope side views. You will also find it easy to park with the exclusive underground heated parking lot, please note that there is limited height access of 6'6". Luxury ski-in, ski-out condo in the Morning Eagle building at Whitefish Mountain Resort. Located in the heart of Whitefish Mountain Resort ski village, close to bars, restaurants, ski rentals shops and more. Has its own ski locker, communal fitness room, outdoor hot tub and heated underground parking garage in the center of the resort village. 30 minutes from the crown jewel of the Continent, Glacier National Park. Whitefish Mountain Resort, formally known as Big Mountain, has the attractions, fantastic Montana skiing, with lots of summer fun too, such as the Zipline, "Walk in the Treetops", mountain biking, hiking trails and much more. 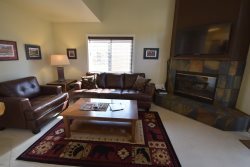 Located just a short 10 minutes to downtown Whitefish and Whitefish Lake this premier condo is located close to all of the best attractions our Flathead Valley has to offer.